The Substance Use-Disorder Prevention that Promotes Opioid Recovery and Treatment (SUPPORT) for Patients and Communities Act allocates resources for treatment and prevention, including increased support for mothers and inmates. Notably, the bill puts $6 billion toward opioid addiction prevention, treatment, and other ancillary problems related to abuse. It also seeks to prevent doctor shopping by requiring prescriptions for certain controlled substances to go through electronic programs. In trying to prevent Fentanyl and other synthetic opioids from entering the country, the act creates and expands programs aimed at detecting them, including a pilot program for point-of-use drug testing. 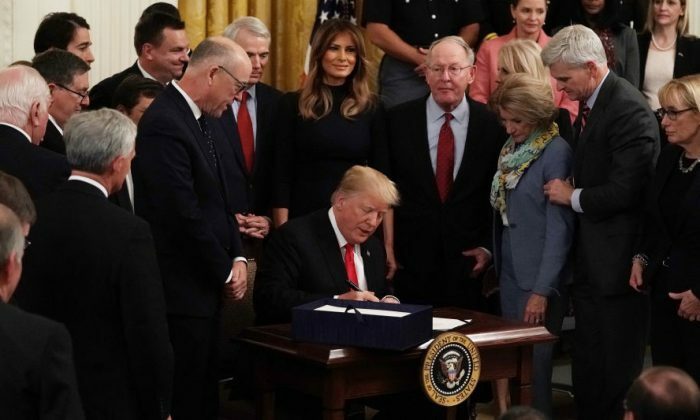 “Together we are going to end the scourge of drug addiction in America, we are going to end it, or we are going to at least going to make an extremely big dent in this terrible, terrible problem,” Trump said before signing the bill. The House passed its final version of the act on Sept. 28, 393–8, and five days later, the Senate passed its final version of by a vote of 98–1. Facing elections in November, legislators have been eager to sponsor bills that target opioid abuse, a blight that has affected communities across the country. The SUPPORT for Patients and Communities Act is a compendium of over 30 of those bills. Almost exactly a year ago, Trump declared the opioid crisis a national public health emergency and directed all federal agencies to find ways to reduce the number of casualties of it. One day before the signing of the bill, Health and Human Services Secretary Alex Azar announced a new initiative to help mothers addicted to opioids and their babies who are on Medicaid. The Centers for Medicare and Medicaid Services will be disbursing $64.6 million in grants to up to 12 states to pay for physical and behavioral health services, such as medication-assisted treatment for opioid use disorder, maternity care, and certain primary care services. This Maternal Opioid Misuse (MOM) model would unlock federal funding almost immediately after the grants are awarded, with states starting to pay for the care starting in the third year of the five-year program. Speaking at the Milken Institute in Washington, Azar also called for a more holistic approach to managing pain, such as using alternative treatments such as physical therapy and nutrition. In keeping with this, Medicare Advantage plans will be allowed to pay for therapeutic massage starting next year. Through the National Institutes of Health’s HEAL Initiative, researchers are trying to find ways to treat pain without creating addiction, including researching non-addictive pain medications. Preliminary numbers on overdose deaths show that the numbers are beginning to plateau. The Centers for Disease Control and Prevention predicted over 71,000 overdose deaths for the last 12 months ending in March, but so far, there have been a little over 68,600 reported. Last year, opioids were related to almost 47 percent of overdose deaths. At the signing ceremony, Trump brought on stage representatives from 21 companies and organizations that had pledged to take some form action to stop the epidemic. He also brought up a member of the Nebraska State Patrol and a woman who works with the nonprofit Unshattered, which employs women who are overcoming addiction. The day before the signing, Trump wrapped up a two-year initiative to bring leaders from all 50 states to the White House to discuss local issues, including the opioid epidemic. “Together, we will defeat this epidemic—it’s a true epidemic—as one people, one family, and one magnificent nation under God,” he said Oct. 24.